If I think of German engineering, I think of efficiency, utility, and horrifically creative design. I see some of that in this knife. I'm sorry if it sounds weird, but I think German engineers just can't help it. 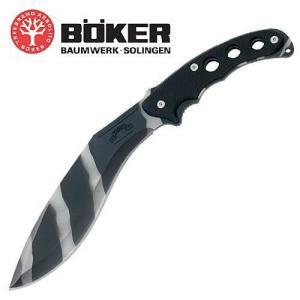 Smaller than the Ka-Bar version of the Gurkha military knife, the 14" Boker Magnum maintains the traditional balance of blade to hilt--in cutting edge and blade weight, nothing has been lost here, at least in terms of proportion. It isn't a short sword, like the military Gurkha knife, but it has the same forward-weighted feel. The only thing cut back is size. There are some features I think of as modernistic--the serrated index finger notch that is supposed to replace the heavy and dependable hilt that was the tried and true solution to grip issues; and the lightweight perforated handle, designed as though a tenth of an ounce in overall weight really mattered. If you like that, it's good. I'm from the old school, people who believe things are slippery when wet, but you may think in other ways. This seems like a very good knife, but it also seems to me to be a niche market knife, designed for a purpose no one quite figured out. That doesn't cancel out the fact that it is extremely cool.